I'm moving over from ST and I had an issue where when I tried to capture the state of a Cree Zigbee bulb it wouldn't work. Bruce showed me the trick that I had to do a refresh on the bulb before capturing it. That trick worked perfectly for a long while until I just converted to HE and can't seem to figure out how to force that refresh on this version of Rule Machine. Any help would be appreciated. I'll attach a screenshot of my rule as it is/was in ST. Sorry, I thought I could share a screen capture. 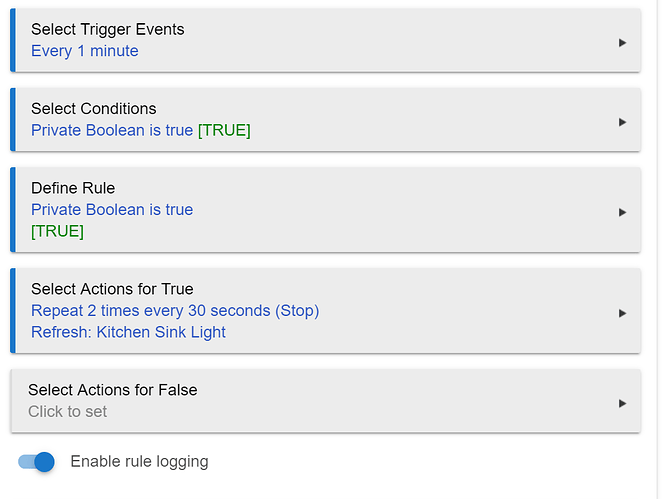 At the bottom of the true actions is something called "Run custom commands" and command I put in was refresh() on Hall Light. This is what I'm using. I did try the built-in app, Z-Wave Poller, but it wasn't working properly so I did what others have done, and created a rule. I did one for each device...it works better that way for some reason. Do you have the Cree connected directly to HE? If you are connecting through a hue Bridge, you have to refresh the Hue Hub device that gets created instead of the bulb itself. No, it's connected direct. And I finally figured out how to do what I needed. The answer was right in front of my nose.